You guys been anywhere scary lately? How about Costco where all your money seems to get scared out of your wallet? No? The inside of a pumpkin is pretty scary because if feels like your hand is covered in worm guts. If you can tough it out - and I know you can! Pumpkin seeds are nutritious snack food for you to stuff in your purse, lunch box, or backpack. The key to cleaning the pumpkin seeds is to toss them into a colander and run some warm water on them. Then just strain the seeds through your hand as you detach them from the orange strings. 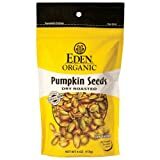 Or you can buy roasted pumpkin seeds (see below), which is cheating, but I'm not gonna tell anyone. Pumpkin seeds are nutritious (ex: 28% of your DV of Iron in 1/4 cup) and they are easy to cook. The fun part of roasting pumpkin seeds is that you can customize the flavor. Below, I have included a recipe that goes to the salty side of the taste spectrum. Add some cayenne and you will have a spicy and salty snack. You could try some sugar and cinnamon, or add pumpkin spice. Whatever your favorite spice flavors - just toss them on the seeds. I suggest trying 1/2 teaspoon for one cup of pumpkin seeds to start because you might overwhelm them with spices. My children are planning to carve TWO pumpkins each this year - so I should have at ton of seeds to roast. 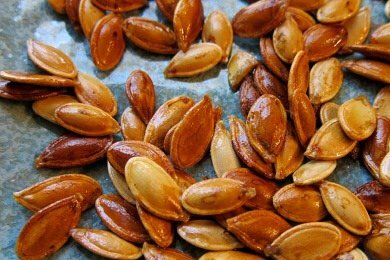 If you keep a bit of the pumpkin goop on them (as in, don't rinse the seeds), you get more pumpkin flavor on the seeds. We roast them like this with salt, sugar, and cinnamon. Thanks, Snackgirl! This recipe and the one for baked pears are both delicious. Thanks for the interesting posts. I LOVE pumpkin seeds! I'm chinese and grew up on sunflower seeds and pumpkin seeds and even watermelon seeds (or some variation of it maybe, 'cause those were a lot larger hmm), but my fave is probably 1) sunflower seeds and 2) pumpkin seeds. it's too bad i don't usually celebrate halloween with pumpkin carving at all, so i don't really get all that extra pumpkin seeds to roast myself! I haven't had any pumpkin yet, but I did just roast the seeds from my acorn squash. They were just as good as pumpkin seeds (both being winter squash and all), but there were fewer of them. Do you crack them & eat the kernel inside, like a sunflower seed? They sound delish! @Lita - no you just eat them whole! They ARE delish - give them a try and tell me what you think. I'm so glad to see the comment about acorn squash because I was wondering if you could do this with butternut squash seeds. I roast our pumpkin seeds every year (I like them with garlic powder & kosher salt) but we eat butternut squash more frequently and I'm always wondering as I toss the seeds down the sink if I could roast them instead! Sounds wonderful... by the way, I eat my sunflower seeds whole shell & all like pumpkin seeds. Fiber! I've now had my pumpkin seeds for almost a week in a tupperware container after I rinsed them (I haven't had a chance to roast them - DYING to do this!). They are still slimy and a couple have sprouted. Think they are still safe to roast and eat!? @Laura Jo - just do it! I think it will work - rinse them again - dry them and roast. Thanks Snack Girl!! I'm just a little paranoid after having just been sick...and they smell kinda funny. I'll try rinsing and drying them again though. Hi, I know this is an old post but just thought I'd let you know I use butternut pumpkin seeds all the time they work great :) Also, I find if you cut the pumpkin in half and run a knife up and down the seed/stringy bit the seeds pretty much come out on their own, then I use a spoon to get all the string stuff out mostly separately. Eliminates the seed sorting ;) Also my toddler cannot get enough of these! I love pumpkin seeds! My family likes them best with olive oil, garlic powder, pepper, and seasoned salt, or olive oil and some Ranch dressing powder.